Ever wanted to learn to climb and (even more important) how to securely belay your climbing partner? We are happy to offer you a beginner’s climbing course at the climbing gym in Bensheim (High Moves – Beginner’s Course) again this year. An email with all the necessary information was sent to the climbing club distribution list. In case you have not received it or are not yet member of the club yet, just get in contact with Volker or someone else from the committee. The 2018 AGM has been successfully held, with a record attendance and very fruitful discussions. Thanks to all participants for that! Volker continues his service as quartermaster. Thanks to the new committee members for volunteering to support the club in the future, and all the best. The minutes of the AGM will be sent out in due time. The 2018 Annual General Meeting will be held on Wednesday 12 December 2018 at 18:00 at ESOC, Room S.113. SEE YOU THERE!! We decided to follow in other clubs’ footsteps this year again and host it on-site, since our AGMs usually don’t run very long. We can go for a drink near-by afterwards (club pays) and will finish well in time for the unofficial Christmas party. The club night that had been originally planned for this day is cancelled. if you don’t have an ESA badge: please let me know that you are coming before 10 December, 16:00. I will then register you as visitors. Please arrive on Wednesday at 17:45 with an official picture ID (drivers licences are not accepted) at the gate house. We will come and pick you up collectively at the gate house. It would be great to see as many of you there as possible! If you have some topics you would like addressed in the AGM and can’t make it or would like them to be put on the agenda, please send me an email. As stated several times, the current chairman and treasurer are not up for election again. We need volunteers to continue the club in 2019. If you are interested in any of the posts, feel free to contact us up front for details on the positions. Again, if you are off-site, please let me know beforehand (by Monday, 1600) if you want to join. See you there with your ideas!! If so, stay tuned, we are currently negotiating a new beginners’ course, tentative dates are 20 and 21 March 2018 (both evenings mandatory). The course will be run by certified trainers from the Bensheim Climbing hall. Details will be communicated here, on the mailing list and via the usual SSCC channels. In case of questions, feel free to contact the committee. 2018 is upon us. It’s time to start climbing again – club nights are starting again (and the website is fully running as well). See the calendar for all the dates. Don’t forget to send us a completed Membership form for 2018 and transfer the fee to our bank account. The destination of the 2017 climbing trip was El Chorro in Spain. Equipped with our personal stuff and two full bags of club gear we took the early flight from Frankfurt International to Malaga. We spend some time discovering the city and eating our first Spanish meal before we picked up the rental cars. Outside the busy city, a beautiful country road took us El Chorro. We stayed at a small house close to the road to have a short way to most of the various climbing spots in the area. The rest of the day, we spend to get to know each other. We had to organize the shopping, the cooking as well as the climbing gear. The place was very peaceful and one could have spent the whole week relaxing in the sun, but that was not why we came. We purchased a Topo from the local climbing community to support them in taking care of the bolting. It includes about 60 spots in the area and lead us to amazing routes. Monday, our first climbing day, was beautiful. We drove to a close climbing spot to get two know the grading, the bolting and the rock. We approved everything and soon fell in love with this climbing region. However, in the course of the week we noticed that the kind of rock differs a lot here. Thanks to the motivated and skilful trip participants in the group, everybody was able to climb as much as we wanted. The highlights were the four-pitch on Tuesday and eventually the 6b+ and 6c routes on Thursday. The clubs fifty-metre half ropes allowed as a fast and easy ascend and descend in the multi-pitch routes. This was an import fact, due to increasing wind speeds. On Wednesday, we voted for a break and visited “Camino Del Ray”. An easy but worthwhile hike through a canyon. Perfect to rest one’s forearms. Thanks a lot to all participants! See you next time! 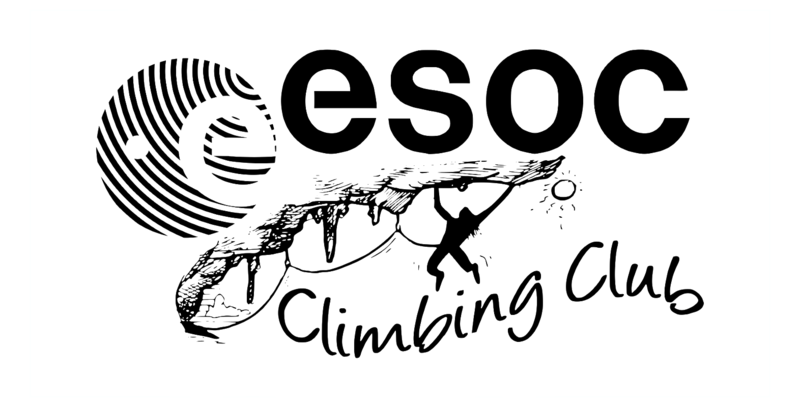 After a year-long hiatus, the ESOC climbing club set out for a climbing trip. Daniel F. volunteered as trip captain (and we hope many will follow his good example) and he organised for us going to Cala Gonone on Sardinia, Italy. It’s the place were climbing started in Sardinia and it offers routes in all levels of difficulty. Eight brave climbers decided to come along – all levels of experience were present. The long weekend in the beginning of May (Ascension of Christ) was perfect for this adventure. The weather on the first three days was perfect for climbing – not too hot, not cold, sunny and a beautiful view on the ocean. We visited three different climbing areas were all of us got to enjoy nice slab climbing in solid rock with anchors at a very safe distance. We managed to get refreshers for abseiling and setting up secure belay stations. In order to engage in some other sportive activities as well, we hit the beach, but only the cold-resisting Spanish and a German in Italian exile dared to swim in the (way too cold) ocean. Some others preferred to squeeze their toes into the climbing shoes once more and do some routes at the beach. Saturday was not so nice in terms of weather anymore. Volker and Ramón managed to get their hands on the rock for a few hours before the rain, while the rest of the group tried to visit one of Sardina’s many caves. We were only lucky at the third attempt, the others were closed or had lunch break. On the last evening we reconvened in Alghero for a nice dinner (pizza, what else?) before catching the plane at 0700 on Sunday morning back to Frankfurt. Over all it was a fun trip. Thanks to all people involved and thanks especially to Daniel F for organising all this. You found us a great climbing area and a beautiful apartment. Looking forward to the next trip, hopefully with more members joining. We completed our Annual General Meeting (AGM) on the 15 December 2015 to close out this year and prepare for 2016. Our club nights were very popular and will be continued at the pace of the 2nd half of 2015. We finally have a central equipment locker, so any of the committee members can help you if you need to borrow club equipment. After the last beginner’s climbing course people would like to learn about lead climbing and climbing outside. We will organise such events and inform you in due time. We want to do more climbing outside, likely starting around May 2016. If you’re looking for climbing partners outside of club nights, please use our mailing list address, through which you receive announcements and other information. Trip captains, or ideas for interesting trips are always welcome. Please coordinate with the committee directly or through our mailing list if you have a good idea for a trip or even want to organise it. The server that hosted the club website before has been retired and we’ve moved to another one. The website is now hosted and maintained by Alexander Lais. If you spot any mistakes or issues, please let us know. We the committee would like to wish all previous members and all future members of our club a happy holiday season, lots of rest and a happy new year. There’s a lot of climbing to be done next year! We’re moving the website to a different server and will move over the content piece by piece. Check back in a few days. Club members will be informed via e-mail as well.